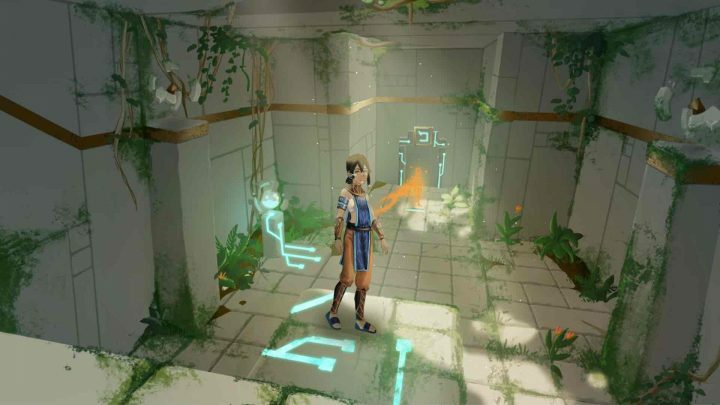 Echoes Of Etrya is a chilled out third person puzzle adventure game where you work cooperatively with previously recorded versions of yourself to make your way through a mysterious temple. In Echoes Of Etrya you take control of a young woman who must venture into an ancient temple to fix the Gears of Time. You are alone and a lot of the mysterious mechanisms in the temple really require two people to operate them properly, but thankfully thanks to your mystical armband you can be two people (sort of). When you stand at special activation points in the levels you can use your armband to start recording your actions. These actions can include standing on switched or moving blocks around the levels and when you finish recording then the recorded version of yourself will carry them out again, allowing you to work alongside them to solve the puzzles. So for instance you can get a recording of yourself to stand on a switch to open a door while the current version of yourself goes through the door. Taking around 30 minutes to play through, Echoes Of Etrya it’s a fun little adventure with a great art style, inventive puzzle design and a very chilled out atmosphere. A mystical time bending puzzle adventure well worth taking some time out for.